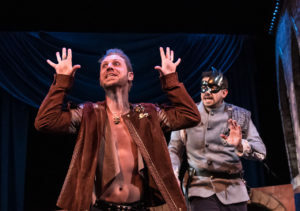 In this unique take on Shakespeare’s most popular tragedy, Quill Theatre continues its tradition of asking audience members to reevaluate their original conception of what makes the Bard’s stories so resonant and impervious to the massive cultural differences between 1500s England and 21st Century Richmond. Quill has mastered the art of translating the texts read in middle school English classes into believable, emotionally captivating, and hilarious performances. 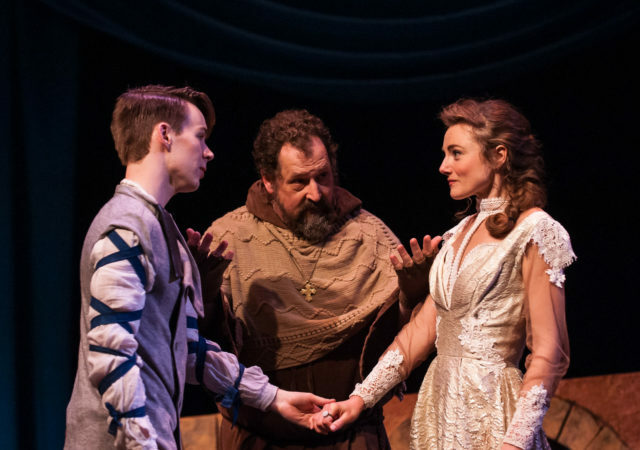 The implicit stage directions scattered throughout Shakespeare’s complex prose are teased out brilliantly in this sophisticated, yet engaging production of Romeo and Juliet at VMFA’s Leslie Cheek Theater. In Quill’s chosen spring production, just as in countless other productions, Romeo Montague falls in love with Juliet Capulet. The lovers, linked by love at first sight and barred by society’s arbitrary expectations, marry in secret after one night of knowing each other. The young couple must contend with a bitter family rivalry, an impending marriage arrangement, and a few murders along the way to their tragic end. There are no spoilers left for Shakespeare’s most popular play. In fact, the familiarity of the show almost encourages trepidation from an audience member seasoned in Shakespeare. 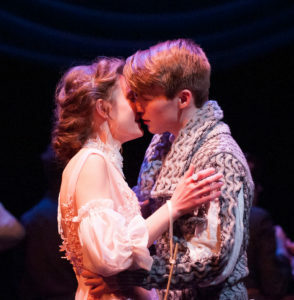 I went to the show wondering how exactly it would be different from the countless variations of the story of star-crossed lovers I’d seen before. I cringed thinking of its most hackneyed lines. (Romeo, Romeo, wherefore art thou, Romeo?) So I was pleasantly surprised when the stellar cast breathed new life into Shakespeare’s most quoted lines. Juliet and her Romeo, played by Liz Earnest and Nate Ritsema respectively, offered a picture of love genuine enough to entangle the audience in their brief daydream of happily-ever-after and naive enough to brew an emphatic sense of dread. The chemistry was perfectly in tune with the play’s central themes. Earnest, especially, lent a youthful wistfulness to the role without fully overshadowing the underlying cunning of her character. Supporting performances provided the backbone of the play. Josh Williams as the boisterous Tybalt and Matt Bloch as the measured Benvolio displayed a breathtaking knowledge of stage-fighting. The choreography was graceful and their execution frighteningly, exhilaratingly life-like. Matt Shofner as Mercutio and Melissa Johnston Price as Nurse elicited consistent laughs, applying to Shakespeare’s words an enviable comedic timing that had me understanding jokes I’d never caught before. That’s not to say any of the performers verged on tropes; in a play so ridden with tragedy, each performer displayed an impressive range. This speaks to the masterful direction of James Ricks and the overall development of the relatively young Quill organization. Romeo and Juliet addresses some serious themes, including family rivalries, street violence, arranged marriage, and suicide. However, in Romeo and Juliet, Quill provides an approachable, digestible introduction to the beauty of Shakespearean prose. This production avoids the tempting tendency to modernize Shakespeare. Instead, it applies an indubitably well-rounded troupe to a beautifully written play, the themes of which still hold relevance today. 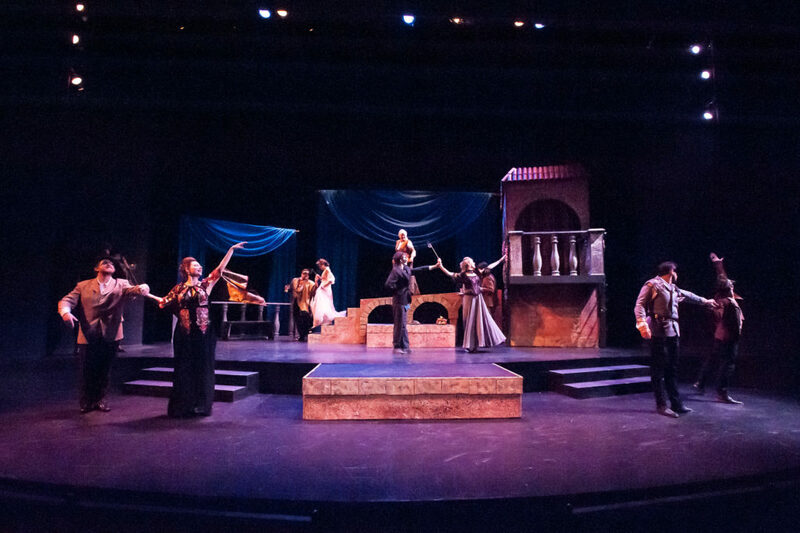 Romeo and Juliet is playing at VMFA’s Leslie Cheek Theater through April 22. For showtimes and tickets, visit Quill Theater. The cast of Romeo and Juliet. Set design by Reed West. A graduate of Maggie Walker Governor’s School, Sam is a college student who studies political science and history. In her free time, she enjoys reading, hiking in Virginia’s state parks, exploring Richmond’s arts and history scene, and spending time with her family.